pathways into national and international leadership for outstanding young leaders. skills and certifications they need to succeed in high-demand careers, and preparing for postsecondary education or registered apprenticeships. Outside the United States, the education component is adapted to the local circumstances. To date, 165,000 YouthBuild students worldwide have built over 33,000 units of affordable housing and other community assets such as community centers and schools. Since 1994, over 140,000 YouthBuild students have performed 48 million community service hours and produced over 30,000 units of affordable, increasingly green housing in rural and urban communities across the USA. The ripple effects of this work through young people helping family members, friends, and neighbors cannot be measured. 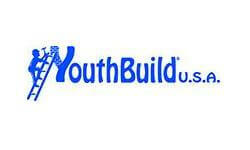 Positions at YouthBuild USA, Inc.